Opening times: Monday-Saturday; 9:30am to 5:00pm, and Sunday 10:30am-4:30pm. Sheila, Colin, & Jude, ready to serve some of our first customers shortly after opening. 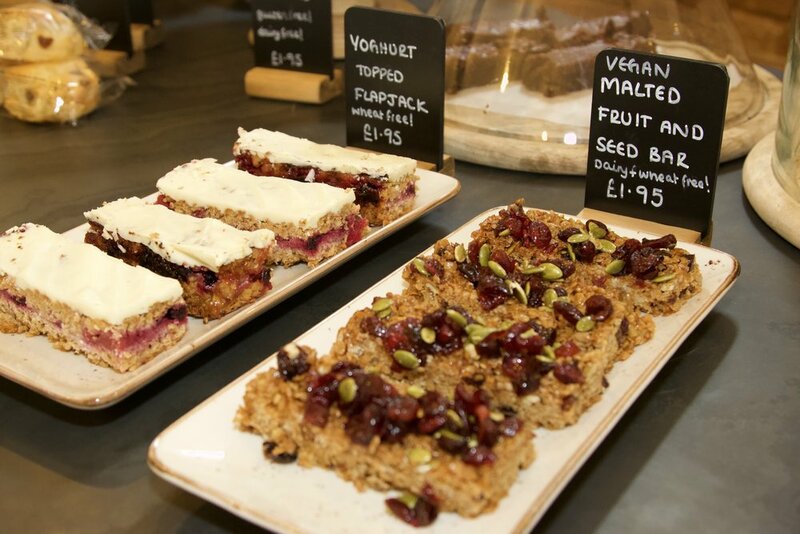 Our range of cakes with vegan and gluten free options also. The hub of our coffee shop. Our large outdoor seating area is truly relaxing, with beautiful plants, added to the sound of running water from our fountain. Our gorgeous snug is great for curling up in, and reading a good book, or catching up with friends. A word about access for the disabled & those with walking difficulties. Having a 16th century building, is not always easy for all our customers and we have done our best to help with access to our coffee shop. If you are or have someone that is less able to move around, and would like to visit then, we would advise you drive to the rear of our property and park in our carpark, which is clearly signposted. In the car park you will find a gate marked "Private", go through the gate, and there is a gentle gravel slope & three steps taking you down to the coffee shop entrance. This is by far the easiest route in and out of the building. If you would like any help if you are visiting on your own, please call ahead on 01494 528 328, and let us know when you are coming, and we would be happy to help you in.